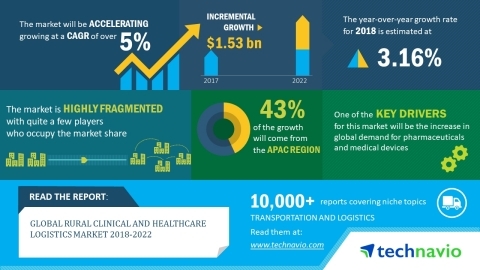 According to the global rural clinical and healthcare logistics market research report released by Technavio, the market is expected to accelerate at a CAGR of more than 5% during the forecast period. The increase in global demand for pharmaceuticals and medical devices is one of the key drivers for the rural clinical and healthcare logistics market. This research report titled 'Global Rural Clinical and Healthcare Logistics Market 2018-2022' provides an in-depth analysis of the market in terms of revenue and emerging market trends. It also includes an up-to-date analysis and forecasts for various market segments and all geographical regions. In 2017, the APAC region accounted for around 40% of the rural clinical and healthcare logistics market share and is projected to contribute to almost 41% share by 2022, exhibiting almost 1% increase in market share. The introduction of blockchain technology in the logistics industry is an emerging trend in the rural clinical and healthcare logistics market. A blockchain system makes use of a thread of cryptographically protected records and the details of transactions for all stakeholders in the supply chain and distributes records across the network of related computer systems, eliminating the need for a central authority to maintain records. Several logistics companies are using the blockchain as a medium to improve efficiency and data security in the supply chain.